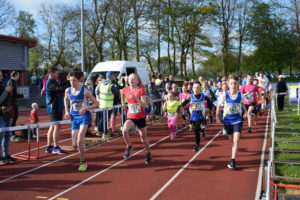 The Bolton 10K’s near-700 field saw Bolton United Harriers host another slick event with racing drama unfold in both the men’s and women’s race. Cool but dry conditions at “daft o’clock” were greeted by the team setting up the 2-lap course within Leverhulme Park. Sunrise brought more club helpers and Registration opened up at 8am! As the One Mile Fun Runners dashed off, the marshal briefing got underway with caps and sunglasses being the ideal apparel to accompany the Hi-Viz jackets. Sporting a suitably alliterative club name to match his own, Guildford and Godalming AC’s Gilbert Grundy led literally from the off. The American, who now lives down south and was visiting up north for a friend’s wedding, proceeded to demolish the course record by 15 seconds with a classy run. 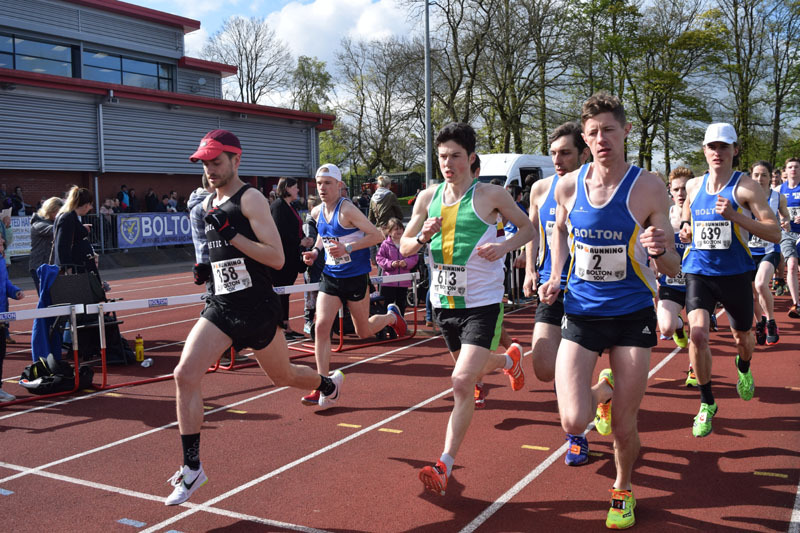 Bolton’s own Karl Darcy, who set a new 10K PB just over a week ago, bided his time by giving Notts AC’s Matty Williams a couple of metres before powering by towards the completion of the first lap – the podium finished in that order. 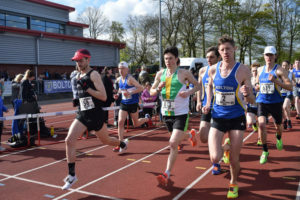 Junior Declan Toomey showed his improvement in 12 months by being nearly two minutes quicker (and fifth overall), whilst Rhys Francis’ top ten position and M50 winner Mark Wolstencroft gave Bolton the team victory (36 points) over Salford (50). In the women’s race, Blackburn’s former England international Pauline Powell’s barnstorming run lowered the course record by 14 seconds on her way to gold and ninth overall. Becky Concannon also went sub-40 for silver, whilst Bury AC’s junior star Sophie Whittaker won a sprint finish by 1 second for bronze, despite running 37 seconds quicker than her victory turn last year! Mary Cheung, Rachel Bailey and Cath Jones formed Bolton’s race team that was edged into silver by the 9 points adrift from Burnden RR (90). The One Mile Fun Run held at 9am before the 10K saw nearly 100 entrants range in age from 4 years old to 61 years young! Junior Blue Vests formed over a quarter of the field, with some great performances to match the attendance. 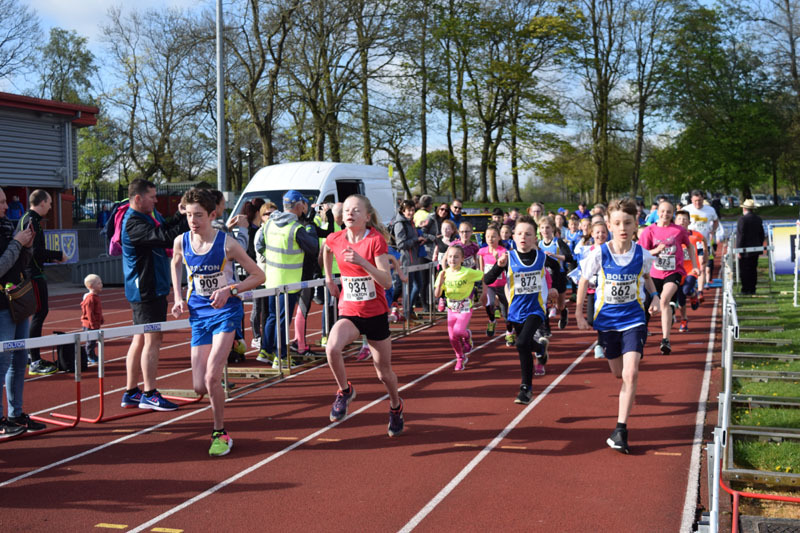 In the open under-15s, Ben Pickford (aged 13) claimed gold with 5:42 (16 seconds quicker than last year), whilst Horwich’s Isabella Merritt (aged 11) was second overall and first placed girl (6:12) around the one lap course; Bolton’s Lily Philbin was second. The kitbag mementos and medals were well received, though the Haribo sweets appear to have won the day! Elsewhere, three Blue Vests completed the ‘other’ big race today – the London Marathon. Congratulations to Craig Renshaw (3:09:30, 2970th), Lesley Heyes (4:00:15, 13448th) and Cecilia Woods (4:22:39, 18692th). Abroad, Ken Fowler clocked 1:35:58 in the Velez Malaga Half Marathon. Despite injuring his ankle a fortnight earlier, he finished fourth M60.